Basic care of Cymbidium Orchids involves, dividing, identifying diseases, and fertilising. Understand the growing guide and care instructions for Cymbidium orchids and you will produce magnificent flowers. One of the most popular orchids to grow and Cymbidium orchids are readily available for sale. The pot of cymbidiums (pictured right), is a classic example of a neglected pot of of orchids, overcrowded and in need of division and a care to bring them back to their best, we tell you how. These Orchids are originally from the Himalayas, over the years they have been hybridised to produce the beautiful cymbidium orchids with long lasting flowers that we love so much. These need a cool winter temperatures to flower. Cymbidium Orchids do not flower well in warmer climates. The flower are widely used in corsages and as cut flowers. Their are two main types, standard cymbidiums and miniature cymbidiums. So basic care involves fertiliser, dividing watering and of course repotting. Asked if you really do need to re-pot Cymbidium Orchids, the answer is yes. They do have extensive root systems and although you can feed them and they will flower eventually you will run into two problems. The first is overcrowding, the plant creates to many back bulbs and pseudo bulbs and becomes tired. Secondly the root system demands it, pictured right is a pot of Cymbidium Orchids that were left a little to long before dividing and repotting, the roots actually split the terracotta pot apart. So as with any plant,proper regular care is essential. At the same time we have seem these hardy orchids growing in the ground beside a garden shed, doing very well with little care at all. Repotting or dividing Cymbidium Orchids. 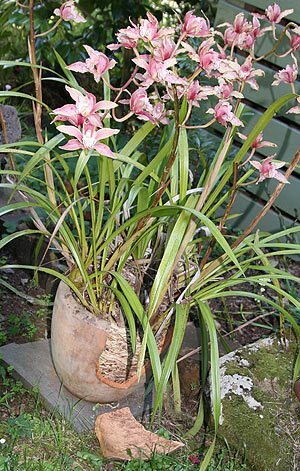 Divide and repot Cymbidiums every second to third year, in the spring after flowering has completed. ‘lead bulbs’ these are the new bulbs that produce vigorous growth and large flower spikes. When dividing cymbidiums aim to have a lead bulb and one or two ‘back bulbs’, the back bulbs provide the energy needed for a new division to thrive. After dividing remove any dead roots and leave the newly divided clumps to harden for a day or two in a cool place. Growing conditions for Cymbidium Orchids. Cymbidiums, are from the Himalayas where night temperature is low. With this in mind we can understand that these orchids require some protection from extreme heat and an overnight drop in temperature to help produce flower spikes. One technique used is to water early in the morning, this helps produce the drop in soil temperature required to promote flowering. These are orchids that prefer bright but indirect light, if the foliage is dark green, chances are they do not have enough light. A healthy specimen will have light green foliage with just a touch of yellowing. Try a sheltered position in a shade house, or under the eaves of your house. A properly formulated cymbidium orchid potting mix is recommended. 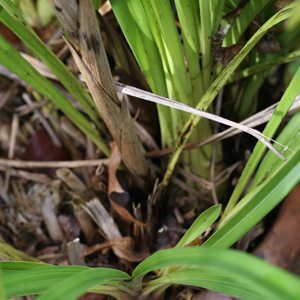 Fertilise the plants as soon as flower spikes appear, we suggest a specialist orchid fertiliser. If you use a slow release fertiliser try every six months, if you use a liquid fertiliser try a diluted (half strength) solution more frequently, every 2 weeks. They are an orchid that does require regular watering, but don’t like to be water logged. If you are using the right potting mix, water once a week in most conditions, however in hot and drying times water more frequently. Other than this cymbidiums require little special care and attention. Yes you can bring Cymbidiums indoors for a while when in flower. Actually growing them indoors is not generally ideal. These are an orchid that require cool nightie temperatures otherwise flowering is poor. Cymbidiums love lots of feeding, we prefer the liquid fertiliser, once every 2 weeks over summer and regular watering once a week, to help produce the flower spikes that these wonderful orchids are loved for.